Home › Finance Books › Rich Dad Poor Dad Review – Best Personal Finance Book? 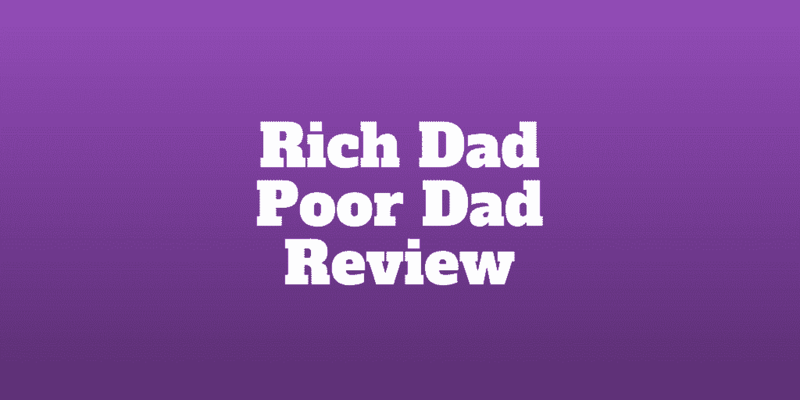 Rich Dad Poor Dad Review – Best Personal Finance Book? In this Rich Dad Poor Dad review, we’ll see what catapulted Robert Kiyosaki’s book to the top of bestseller lists globally and why his critics have fired missiles at him for controversial statements made in his book. You will find out whether the Rich Dad Poor Dad book is one of the best personal finance books ever written or not worthy of your time. And you will discover how to transition from salaried employee dependent on a job for income to become an investor who makes money work for them. Rich Dad Poor Dad Book: Who Is It For? Are Robert Kiyosaki & Grant Cardone Wrong? Which Cashflow Quadrant Do You Fall Into? For aspiring entrepreneurs, reading Rich Dad Poor Dad is almost a right of passage these days. The book is jam-packed full of concepts that are rarely taught in traditional academic institutions. In conventional school systems, students generally study materials to pass a test and must sit exams alone in order to graduate. Kiyosaki shoots down this idea as a poor template for business success. He argues that in order to succeed in business, you need to collaborate with others, learn to work as a team, and join forces with others who can accelerate your progress towards achieving goals. In school, Kiyosaki says “collaboration” with others is viewed as cheating. So, he argues that students learn a bad lesson: working with others leads to punishment when in business it is needed to become successful. If the idea of working in teams to achieve big goals sounds more to your liking then Rich Dad Poor Dad is probably going to be a personal finance book you’ll really enjoy. While aspiring business creators will find lots of value in Rich Dad Poor Dad, business owners who have already experienced significant success may find it less valuable. The book is a less about “how to become a successful entrepreneur” as it is a contrast between how employees think versus how rich people think and operate. Readers looking to receive actionable advice about how to build a successful business will likely be disappointed. However, anybody who has come through the traditional education system will almost certainly experience dozens of eye-opening moments. For example, Kiyosaki contrasts how employees make money compared to how business owners and rich people make money. Employees exchange their time for money every day they show up at work, whereas rich people build wealth by investing capital in assets that produce a regular stream of cash flow income. As a result, rich people make money 24 hours a day whereas employees only make money when they show up to work. Like Grant Cardone, Robert Kiyosaki believes that learning how to sell is the key skill needed to succeed in life and business. Kiyosaki describes his experiences of selling Xerox copy machines and being laughed out of an office by one prospective customer because he (Kiyosaki) did such a poor job selling the machine. But before leaving, the prospective customer advised Kiyosaki to keep going as a salesman because he had the courage to stand before a stranger, pitch a sale and ask for money. Kiyosaki says that while salespeople have a reputation for being slimy, the reality is every CEO is ultimately a salesperson for their company because their primary responsibility is to generate sales. Grant Cardone goes even further with this idea. He says that in order to succeed in life and relationships you need to master how to sell too. By way of example, he shares a story about his wife, who was initially reluctant to date him but by “selling her” successfully on the idea of going on a date with him he finally won her over. If you are fairly new to investing, some of the concepts shared by Robert Kiyosaki and Sharon Lechter will seem startling. A famous but highly controversial one is the idea that an asset is something that puts money in your pocket. By this definition, a house is not an asset because it takes money out of your pocket each month. But all conventional accounting standards would label a house as an asset. By standing squarely head on against the entire accounting industry, Kiyosaki has received a lot of criticism. Nevertheless he has not wavered from this unconventional perspective. And he’s not alone. Grant Cardone also advises that nobody ever own a home either. The idea behind this advice is that if you could invest your money in an asset that produces a higher return over 30 years you would end up with more money than you would by simply paying off a mortgage. Plus, home prices don’t always rise over long time periods so there is no guarantee that owning a home is going to be a valuable investment. Before blindly following this advice, you should think about whether it makes sense for you because renting has its own downsides. When you rent, the amount you pay each year may increase if your landlord decides to hike your monthly payment each year. If your landlord decides to sell, you may be forced to leave your home. And when you pay rent you don’t build any “ownership” or equity in your home. At least when you own a home you can lock in the monthly payment amount and be confident you will own the home in 30 years whereas when you rent you end up with nothing after 30 years. Now imagine if you paid rent for your entire life, you could perhaps end up paying 60 years of monthly costs, which could possibly increase each and every year at the discretion of your landlord. Sum up all those payments and it may amount to the equivalent of paying off two homes entirely! Perhaps one of the most valuable concepts Kiyosaki shares is what he describes as the Cashflow Quadrant. Most people go to school and then many go to University in order to earn qualifications needed to be hired as employees by companies. But to become rich, Kiyosaki recommends migrating from the Employee category to one of the other three categories: Self-employed, Business Owner, and Investor. As an employee, you exchange hours of your life for money. If you don’t show up when your boss requires then you get fired. When you migrate to becoming self-employed, you gain more freedom. You get to show up when you want to work but you still need to perform the job in order to get paid. As a business owner, your flexibility and responsibility increase further. People work for you and so, if your business is set up well, you earn some money from all their efforts. Each dollar your profitable company earns as revenue is allocated. Some portion goes to employee salaries and, after all expenses are paid, you end up with some profits from the collective efforts of the team. When you become a business owner, you have more freedom to take days off when you like and set work schedules. However, you also have more responsibilities to hire employees, manage human resource issues, pay salaries, set up healthcare and retirement plans and so on. The most coveted category is the Investor, who doesn’t need to show up to work as an employee, doesn’t own a job like a self-employed individual, and doesn’t need to manage employees like a business owner. An investor puts money to work and receives regular cash flow from investments, so they don’t need to work a 9-to-5. Instead, money works for them. An example of this is a dividend-paying stock like Ventas, which pays out a fixed amount of the total you invest each year. While Rich Dad Poor Dad is an eye-opening read for aspiring entrepreneurs and employees who never previously considered an alternative career path as a self-employed person or business owner, it may not be right for seasoned entrepreneurs looking for specific advice about how to take their companies to the next level. It’s probably a good idea to take some of the more controversial topics with a pinch of salt. For example, Kiyosaki argues that it is less risky to be an entrepreneur than it is to be an employee. As an employee, you can be fired at any time. Your salary is in the hands of a boss. And your income is dependent on whether you come to work each morning. By contrast, an entrepreneurial venture provides you more freedom, control, and flexibility. Nevertheless, we suggest that anyone considering jumping ship from employee to self-employed or business owner status thinks deeply about the pros and cons first. Many successful entrepreneurs say that in their quest to live a life with more time and freedom, they ended up working much harder than they did as an employee. And entrepreneurship has its own set of risks. If you don’t find the right business model which can produce predictable profits, you may end up out of business and lose out on a stable career path. Plus, hidden hardships lie in wait for entrepreneurs. Taking out a bank loan can be difficult unless you have stable income – a luxury many self-employed individuals do not enjoy. Successful entrepreneurs tend to embrace risk too so you need to have the right mindset. Day one after quitting your job, you need to generate income from somewhere. Be sure what goods or services could be sold to acquire customers. And be goal-oriented so you have a clear plan to reach milestones. If the idea of setting up a company as a business owner or becoming self-employed doesn’t sound too appealing, consider dipping a toe in the water as an investor while remaining a salaried employee. By squirreling away savings each and every month, and then investing them, you tie yourself to the future wealth and economic prosperity of already successful companies. If you not sure where to begin, consider outsourcing your investments to Betterment or Personal Capital. These robo-advisors are much more than automated investment management services. These days, they can also connect with you financial advisors who help you to plan for your financial future and charge much less than traditional financial advisors. Over time, the compounded gains from your investments can produce sufficient income so that you no longer need to depend on a job alone for money. If you prefer to invest your own money, consider ways to boost income from stocks you own beyond what dividends pay. For example, you could look to sell covered call options at a specialist options broker like tastyworks or thinkorswim. Above all, remember that cash gets whittled away over time as inflation eats into its purchasing power. So, while it’s important to have a cushion of cash for emergencies, it is crucial to invest for the long-term in order to build up a nest-egg that affords you the luxury to retire.